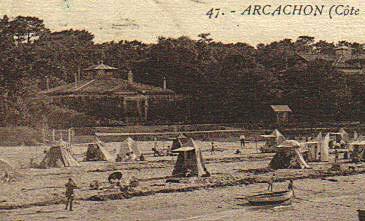 Arcachon’s La Salesse villa was built in 1854, making it one of the oldest properties in the town. And it played a bit part in the maverick career of the Spanish surrealist painter Salvador Dalí. In 1936, Dalí fled his native Spain, which was in the midst of a civil war. For the next three years, he and his wife Gala divided their time between London, New York, Paris and fashion designer Coco Chanel’s residence in Roquebrune on the French Riviera. By 1939, the travelling was taking its toll though and war was looming large. 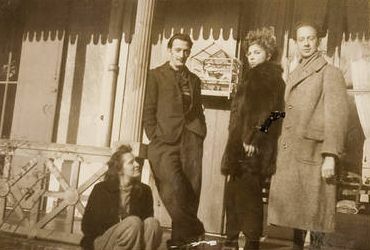 Dalí and Gala headed to the Pyrenees for some downtime, staying near the Spanish border at the Grand Hôtel in Font-Romeu (although Dalí later noted that for him “to rest meant to immediately begin to paint 12 hours a day”). But their hotel suite was commandeered by the Chief of Staff of the French army who was in town to inspect border fortifications. Dalí and Gala elected to head to Paris. Once there Salvador unfolded a map of France and “studied my winter campaign, trying to plan it in such a way as to combine the possibility of a Nazi invasion with gastronomical possibilities”. Putting his finger as close as possible to the Spanish frontier “and at the same time on a neuralgic point of French cooking” he ended up pointing at Bordeaux, “one of the last places the Germans would reach if they should win. Moreover Bordeaux naturally meant Bordeaux wine, jugged hare, duck liver aux raisins, duck aux oranges, Arcachon Claire oysters…” The penny dropped: Arcachon would be Dalí’s choice for his wartime refuge. The Dalís arrived around late August/early September 1939, just days before the Allies declared war on Germany, and stayed in this colonial-style villa which they rented from one Henry Calvé of Bordeaux, who later turned down Dalí’s offer of a portrait in gratitude. At the time, the villa wasn't locked in by neighbouring buildings. The scene looked more like this and this, as featured on visuel.free.fr. The villa boasts its own little panoramic belvedere, a no doubt excellent vantage point to take in the view over Arcachon bay! Dalí set up a studio and produced many pieces including “Slave Market with the Invisible Bust of Voltaire”, the first in a series of double-image paintings, possibly “Telephone in a Dish With Three Grilled Sardines at the End of September”, and two magazine illustrations (which also used the double-image technique): “Appearance of a Scene of War in the Face of the Lieutenant Deschanel” for Paris Match and “Actress Betty Stockfeld Is Metamorphosed into a Nurse”, for Pour Vous. It was not all work though. Dalí would take time out to decorate seashells brought to him by local children. And with next-door neighbour, fellow surrealist painter Leonor Fini, the Dalís would often eat out at restaurants in Bordeaux and go sight-seeing locally. They are pictured below with surrealist writer André Pieyre de Mandiargues at Villa Salesse and on the Dune du Pilat. 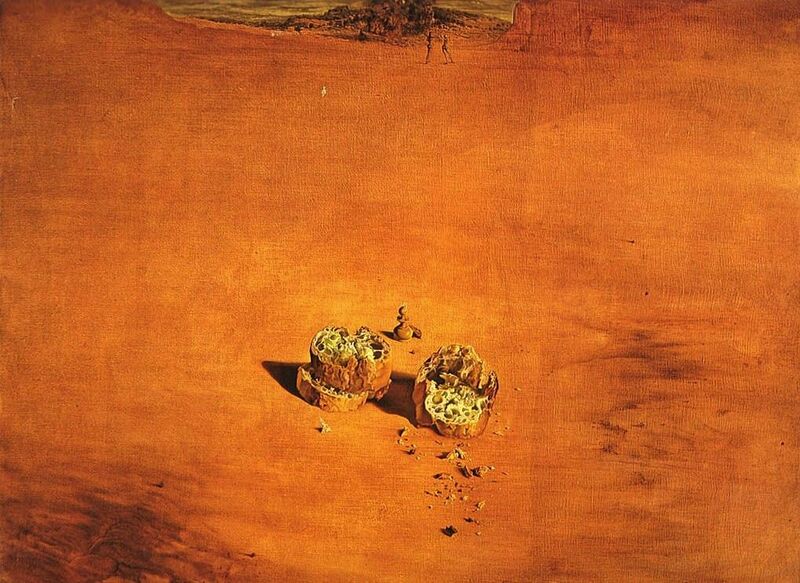 It is thought that the Dune inspired the sandy background of the painting “Two Pieces of Bread Expressing the Sentiment of Love”, the chess pawn of which is a reference to the games of chess Gala played in Arcachon with artist and writer Marcel Duchamp while Dalí painted. With the Germans making headway in France though, the Dalís decided to make a move once again, barely six months after arriving in Arcachon. They spent “a sinister day” in Bordeaux as German bombs fell nearby, obtaining visas (numbers 2519 and 2520) to leave the country from Portuguese consul Aristides de Sousa Mendes, and fled into Spain shortly before the bridge in Hendaye was seized by the invader. After a short time spent back in Spain and Portugal, the Dalís relocated to the United States, where they went on to spend eight years. Meanwhile, back in Arcachon, little or no trace of their brief passage remains… but wouldn’t it be great to find out what became of those children’s seashells! > Much of the information in this piece was loosely adapted from a post on the excellently-named Dali Planet website, which sadly appears to be no more but nevertheless deserves a posthumous credit here. The Dalí quotes are extracts from the artist’s 1942 autobiography “The Secret Life of Salvador Dalí”.